We’d love your help. 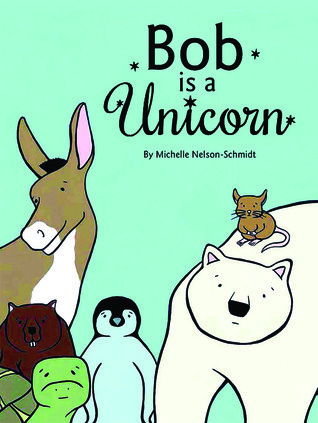 Let us know what’s wrong with this preview of Bob is a Unicorn by Michelle Nelson-Schmidt. Bob is not a unicorn. His friend George knows that. So does Stella. And Ted, and Larry. In fact, it's definite: Bob is not a unicorn. Or is he? Bob is a Unicorn, by beloved author Michelle Nelson-Schmidt, celebrates both the power of imagination and the importance of always - no matter what anyone else says - believing in yourself. To ask other readers questions about Bob is a Unicorn, please sign up. I'm just not really sure how to review this book. It didn't seem to me to have much of an actual story, but the illustrations were cute, and the last couple of pages were ADORABLE. If that were all there is to it, I'd give a two. But it's not! It's a children's book, and so that needs to come into account. If you do the voices for each character and have the plush to speak when Bob does (no, His name isn't why I bought it! Okay, partially. ), your kid will still go WILD for it, my little girl abs I'm just not really sure how to review this book. It didn't seem to me to have much of an actual story, but the illustrations were cute, and the last couple of pages were ADORABLE. If that were all there is to it, I'd give a two. But it's not! It's a children's book, and so that needs to come into account. An amusing book about an animal who wants to be a unicorn. Somewhat reminiscent of Klassen's This Is Not My Hat, with its layout of one page illustrating the animal Bob is talking to with the opposite page containing their simple dialog. The large, clear illustrations and few words could lend itself well to reading aloud. What a great book. I love that it is written in a dialogue format so that my daughter and I can read it together, back and forth. Makes it a lot of fun. Surprise ending and we both just loved it. A story with dialog (could be used as readers theater) that is about the creativity of our imaginations and how others sometimes don't see it. This was a really cute story and the illustrations were adorable. Michelle Nelson-Schmidt does it again and writes another story with the theme of being a little different, and having a big imagination and being proud of it. My only reservation about this story is that because we never see the main character I got confused about who was actually talking at the beginning of the story. I thought Bob was the Moose at first! Once we got to the second and third pages though of course I realized that B This was a really cute story and the illustrations were adorable. Michelle Nelson-Schmidt does it again and writes another story with the theme of being a little different, and having a big imagination and being proud of it. My only reservation about this story is that because we never see the main character I got confused about who was actually talking at the beginning of the story. I thought Bob was the Moose at first! Once we got to the second and third pages though of course I realized that Bob is talking to the other animals. While I wasn't sure if I liked this story as much as her other books, I do have to give credit to the author in that the illustrations are simple and cute, and the dialogue sounds just like how a child with a big imagination would talk. I also really like that the author captured the attitude and character of a child. Invaluable is the friend who “gets you” and takes the time to be amused when your other friends are too busy. That is the message of this book. Who says you can't be a unicorn??? Such a sweet story! This book is recommended for children ages 3-7 years old. Bob truly believes he is a unicorn, but all of his friends say he isn't, until he meets a beautiful fairy. The fairy sees that he is the most exquisite unicorn in all the world, but why do his friends say is isn't? An activity for this is bringing in some props and have students use the props to pretend they are something they are not. Have the students guess what they are supposed to be and have them explain what they are supposed to be This book is recommended for children ages 3-7 years old. Bob truly believes he is a unicorn, but all of his friends say he isn't, until he meets a beautiful fairy. The fairy sees that he is the most exquisite unicorn in all the world, but why do his friends say is isn't? An activity for this is bringing in some props and have students use the props to pretend they are something they are not. Have the students guess what they are supposed to be and have them explain what they are supposed to be when the others are finished guessing. They can compare their ideas to Bob and the fairy. Schmidt, M. (2013). Bob is a Unicorn. Tulsa, OK: EDC Publishing. This is one of my absolute favorite children's books. I love the art, the perspective, and the message! You don't actually see the main character (Bob) of the book until the end. All you see are his friends, none of whom see him as he sees himself. There is a wonderful message about self-perception, being yourself, using your imagination, and freeing oneself from stagnant concepts of reality. I think I might love this book even more than my kids do, which is quite a feat! I love unicorns and I love this book! I found it at the school book fair, and I bought it for my daughter. She loves it! It is simple, yet cute, and the story keeps going. You definitely are left wanting more, in a good way. Great for children of any ages, boy or girl. This is one of my favorite children's books. It's a simple story, with gorgeous illustrations, and it ALWAYS brings a little happy tear to my eye. It's about the power of imaginations and making time to play! This would be fun to read with another person. I would love to use this in a program! Loved this picture book! It was funny and whimsical.